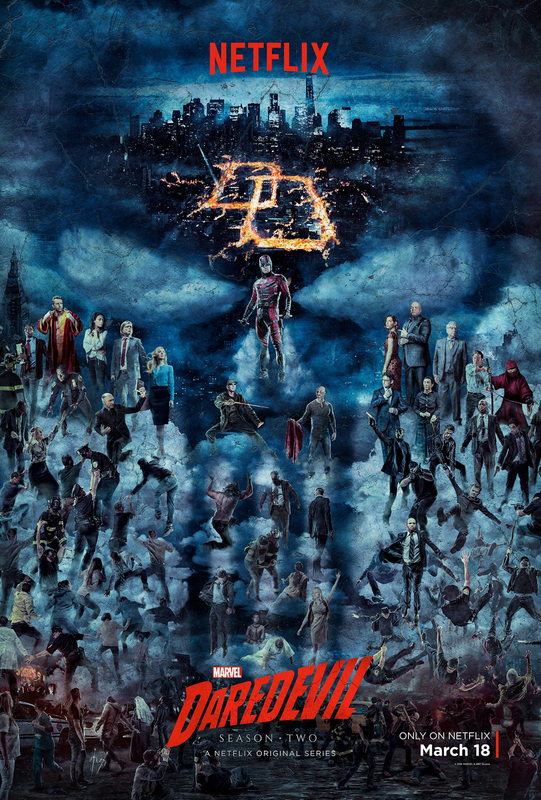 Posters for season two of “Daredevil” modeled themselves after religious paintings, including a version of the Sistine Chapel ceiling. The titular character is Catholic and frequently attends confession throughout the series for the violence he performs. Continuing its previously built trends, the second season of “Daredevil” delivers dark, gritty super heroics while also upping the stakes and introducing new elements into the series’ mythos. After the downfall of Wilson Fisk’s criminal empire, the various gangs of Hell’s Kitchen are competing to take up the reigns as the chief power in the city. However, these gangsters soon find themselves being butchered on the streets by a serial killer known as the Punisher (Jon Bernthal), who utilizes military-grade weapons and tactics to take out criminals. This forces Daredevil to confront the negative aspects of vigilantism as he tries to capture someone who is just trying to clean up the streets, but in a more lethal way. At the same time, Marvel has its first attempt at more mystical elements in the Marvel Cinematic Universe, introducing the Hand, a villainous clan of ninjas with immortality who have greater plans for the city of New York. Daredevil must confront his greatest foe yet, while also dealing with the return of his ex-girlfriend, Elektra (Elodie Yung), who is also at war with the Hand on her own terms. While this may all sound very abstract and strange compared to the more realistic tone taken by the first season, “Daredevil” manages to find the right balance between drama and its more comic-bookish elements. There are plenty of touching, emotional moments to be had between the incredibly well shot and choreographed fight sequences with masked assassins. A true treat is Bernthal’s depiction of the Punisher. While he does not quite have the appearance down all the way, he definitely has the character’s mannerisms. The dead-eyed, serious look he gives as he goes in for the kill is truly frightening, but Bernthal is also skilled enough to turn the character sympathetic when needed. Elektra also turns out to be a surprise high point of this season. While I personally did not have much interest in the comic book version of the character, “Daredevil” made me care about her for the first time. Plus, it is always refreshing to see more female superheroes in the genre, and Yung manages to convey both deadliness and occasional vulnerability with her acting. Season 2 takes the time to explore more of the legal aspects of Daredevil’s secret identity, defense lawyer Matt Murdock. Murdock and his partner, Foggy Nelson (Elden Henson), take on their first true court case this season, adding just the right amount of legal drama while not overly bogging down the action side of things. Although the season does suffer from the lack of Vincent D’Onofrio’s Wilson Fisk, as the Hand never quite manages to be as compelling a villain as the Kingpin, it makes up for it with the faster pace it takes. No longer does the audience see Daredevil struggle while dealing with a single gangster. He now takes on entire mobs by himself, rarely falling for the usual action cliché of punching someone only once to knock them out. The fights remain as compelling as ever, putting even movies to shame. The fact of the matter is, if you liked “Daredevil” season-one, season-two will not disappoint. The show more fully embraces its comic book roots, while not losing the aspects that made it so good in the first place. Even the legendary hallway fight scene from season one finds itself outdone. The drama may have suffered a small amount, but the action thrives to its greatest degree, and it will be interesting to see where Marvel takes the Punisher in the future. Look forward to the lethal vigilante having his own mini-series in the future.